When you tour Colonial Williamsburg during the holidays, you’ll see the town’s signature Christmas decorations that greet guests strolling down the picturesque streets. 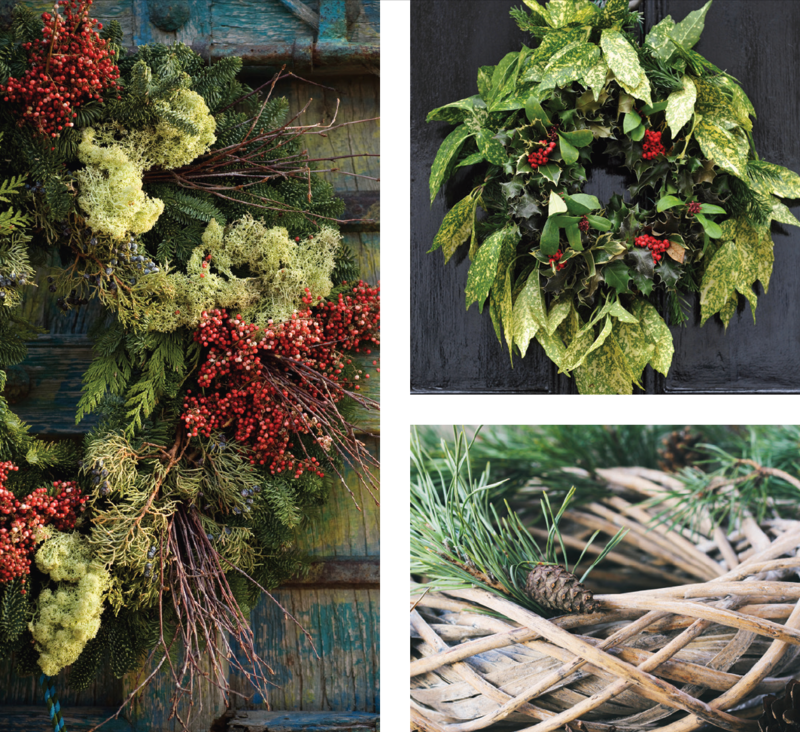 Evergreen wreaths, swags, and garlands are uniquely adorned with colorful fruits, berries, leaves, seed pods, and even seashells. They speak to simpler times… resourceful times… times when the Earth’s own creations were cherished treasures. No laser light shows, inflatable snowmen, or plastic reindeer here. The natural look runs the show every year—and has influenced homeowners all over the country. Perhaps this Christmas you will be inspired to add a bit of nature to your Noel. You might be surprised to hear that the handmade decorations from Colonial Williamsburg which sparked a decorating trend aren’t actually part of the town’s rich history—at least not before the 1930s. While Christmas was celebrated in 18th century colonial America, home decorations were minimal, especially ones placed outdoors. Some historians say the townsfolk never would have wasted fruit and vegetables on a decoration that just hung around and was never eaten. An article in the 1996-1997 “Colonial Williamsburg Journal” (by Libbey Oliver and Mary Theobald) says that the idea to use fruit in decorations actually circulated in a home decorating magazine in the 1920s. The magazine suggested using natural products for decorations in the way that Luca della Robbia, an Italian Renaissance sculptor, did when circling his terra cotta artwork in sculptured fruits and foliage. Transferring the “della Robbia” style to home decorations was first embraced by the magazine’s wealthy readership. But by the late 1930s, when Colonial Williamsburg started decorating for Christmas and adopted the style itself, visitors began copying it in their own homes, popularizing it across the country. The appeal of della Robbia decor is the brightly-colored fruit that accentuate a backdrop of fresh evergreen boughs. Many people choose traditional Christmas colors, incorporating apples that are red, green, or even both, like the McIntosh variety. Pomegranates are another red alternative, matched with limes or green pears. But some designers have created an even more colorful display with oranges and lemons. The more color variants, the longer a display can stay up after Christmas is over. In Williamsburg, you will also see whole pineapples—large and miniature—used in many of the wreaths and in toppers above the doors, as the pineapple remains a sign of hospitality. It’s one thing to work with light greenery in making a wreath, but the heaviness of fruit poses a challenge. The Williamsburg designers stick thick wire through the middle of the fruit, then bind it to the greenery in the back. Some decorations are built on a wood base with nails on which to impale the fruit, and other greenery is then stapled around it. Another way to make your fruit-accented decorations last longer, whether outdoors or indoors, is to use dried fruit, such as orange slices, which add a lovely texture to the piece. To dry fruit, line a baking tray with parchment paper and bake slices in an oven preheated to 150 degrees; bake for three hours and flip after the first 90 minutes; air dry on a cooling rack for an additional three hours. If you don’t want to dry your own, a range of dried fruit is available online. Dried flowers can also add some staying color to your decoration. And, like our mothers always said, we can’t forget our vegetables. Consider adding whole artichokes as “blooms” on a wreath, tucked between okra pods and dried peppers. In addition to your garden and orchard, the great outdoors can provide plenty of other natural materials for your della Robbia decor. Large, shiny magnolia leaves are a natural favorite and, combined with varied sizes of pinecones, wheat stalks, or milkweed pods, can provide the bulk of a wreath. Other popular wreath base material include grapevines, boxwood, fir, mountain laurel, rosemary, and ivy. Fruits and berries of all sizes and colors offer colorful contrast to the browns and greens. And then there is always the Christmas necessity: mistletoe. Nature provides more than just beautiful patterns and colors: Take advantage of wonderful natural fragrances by sneaking in cinnamon sticks, pine boughs, and cedar clippings. 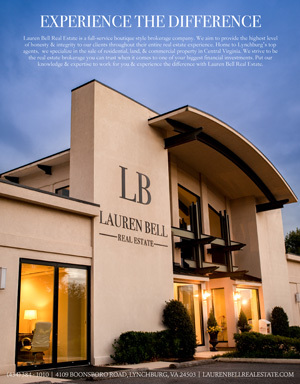 Some designers have stretched their imaginations to include locally available resources and symbols. 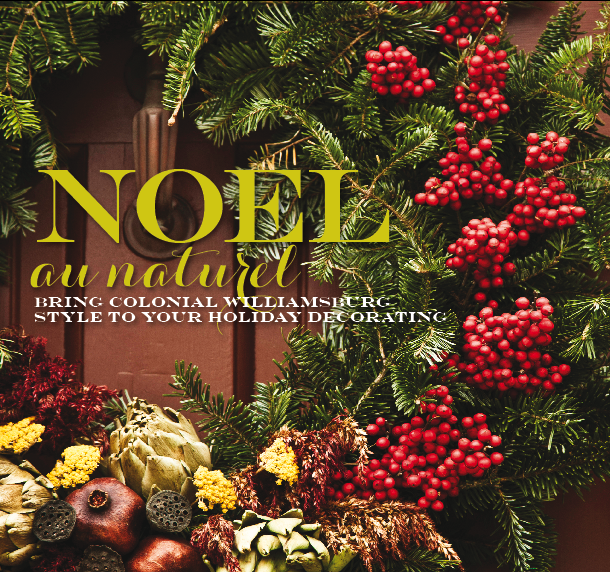 In Williamsburg, where the town’s residents get in on the fun by joining a decorating contest, you may see creative wreaths made with mushrooms, peanut shells, seashells (large oyster shells are a favorite), cotton bolls, and even the left-behind gifts of wildlife—antlers and feathers. Building Materials. Depending upon your desired creation, you might need: a grapevine or wire wreath form; needle-nose pliers and wire cutters; green spool wire and/or floral wire (medium and heavy gauge for various fruits); floral tape and floral wire picks; gloves. Greenery. Evergreens such as spruce, boxwood, magnolia, holly, pine, or cedar. A combination of several types will provide interesting contrast. Accents. Pinecones, fruits (apples, pomegranates, oranges, lemons, pears, etc. ), dried flowers, berries, and/or vegetables such as peppers and artichokes. Prep. Pre-soak cut evergreens in lukewarm water for several hours or in a bucket overnight. Building the Base. Gather several bundles of evergreens and use wire to attach them to your base form. Then begin adding your accents, starting with the largest items first. Symmetry. Space your fruit clusters at equal intervals. For a wreath, start with fruit clusters attached at the 3, 6, 9 and 12 o’clock positions. Securing in Place. 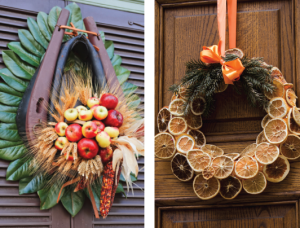 Attach fruit by inserting sturdy wire through its center and wrapping wire onto the wreath form. Pinecones and berries can be fastened to floral wire picks with floral tape, then inserted into the foliage. All-natural Christmas decorations can certainly take us back to a more primitive era, before glitter and metallic bows made their way into the holidays. 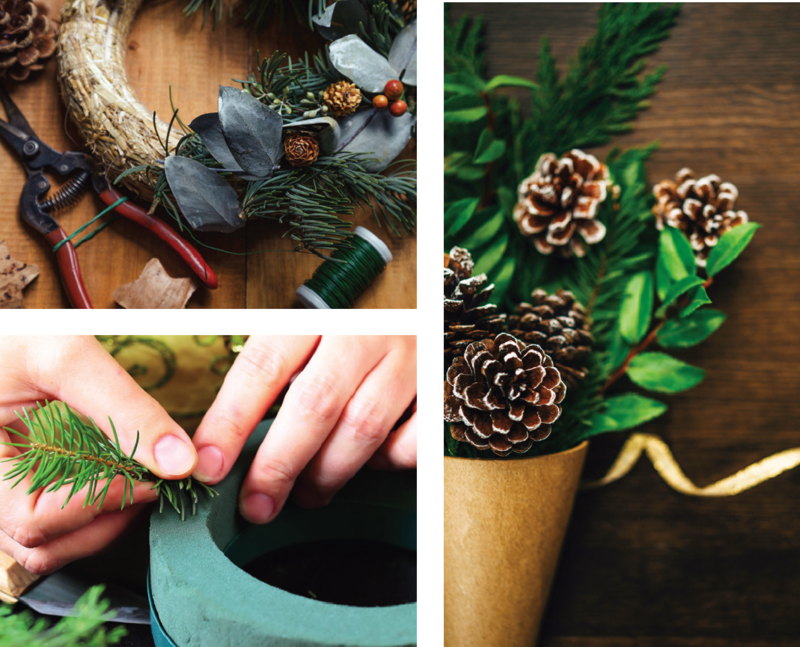 It can be a welcome change in the midst of a busy gift-giving season to accept the gifts that Mother Nature gives us year-round, and to share her gifts with our family and friends.